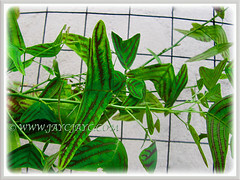 The Swallowtail Plant is grown for its captivating variegated leaves. We were extremely delighted that we sighted several pots of the Swallowtail Plant or Butterfly Wing at Cactus Point, Cameron Highlands during our vacation in October last year. Of course, we grabbed a pot that costs us only RM9.50 as we’ve lusted for this beauty for ages. Besides, it exudes such elegance as the plant dances in the gentle breeze! Botanical Name: Christia obcordata (syn. : Lourea obcordata, Christia subcordata). Common Names: Swallowtail Plant, Butterfly Leaf, Butterfly Wing/Plant, Butterfly Leaf ‘Stripe’. Origin: Native to Southeast Asia and Brazil. Features: Christia obcordata is from the genus Christia that consists of about 18 species of flowering plants. A fast growing perennial shrub that can reach about 60-120 cm tall. It grows from a rhizomatous rootstock. Though seemingly fragile as a spindly plant and needs staking when it becomes too tall, it is robust and sways with the wind unscathed. 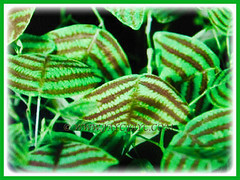 Leaves held on thin wiry 8-10 mm petioles are in green and prominently veined in shades of deep maroon. 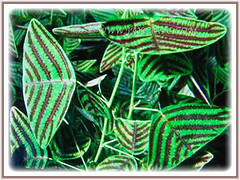 Their unique and trifoliate bright green leaves are compound with 3 leaflets and splashed with burgundy or maroon stripes. Larger than the two leaflets is the terminal leaflet that is shaped like a boomerang. They are uniquely patterned like beautiful wings of a butterfly and even resembling a swallow with spread wings. 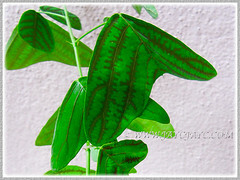 No wonder, this lovely plant is commonly named Swallowtail Plant and Butterfly Wing. Leaves hang downwards when night falls. Inflorescences are 5–15 cm long with hairy pedicels. 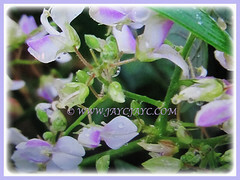 The inconspicuous and small flowers are pale pink and about 6 mm in diameter. Calyx is reticulate veined with upper 2 lobes of calyx connate and lower lobes almost as long the tube. Seeds appear on slender raceme of 5-15 cm lengths at terminal growth. The fruit is a legume and 4- or 5-jointed. Matured seeds are blackish brown, about 3 mm x 2 mm. Seeds are glabrous and wholly enclosed by the calyx. 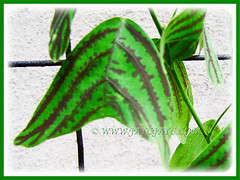 Culture (Care): Christia obcordata or Swallowtail Plant can be easily grown with least maintenance. Light: Full sun, filtered sunlight or partial shade. Leaves may be scorched by direct sun. Moisture: Medium to high water requirements. It loves humidity. Soil: Best in humus-enriched, loamy and well-drained soils. However, it has adapted to a variety of soils. Others: Light pruning is necessary to keep it low, otherwise it’ll need staking when it becomes too tall. Feed once monthly with a fertiliser meant for foliage plants. Generally free from serious pest and diseases. However, do check occasionally for white flies to prevent infestation. 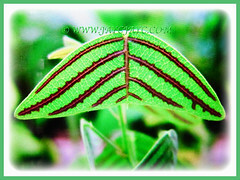 Christia obcordata or Butterfly Leaf ‘Stripe’ is a deciduous annual or perennial shrub that flowers from spring to autumn. It is really sensitive to cold weather and goes dormant in winter but springs back when warm weather returns. For non-hardy regions, it is best to grow in a container to bring easily indoors to a bright window during cold weather. 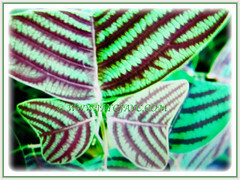 Excellent as a houseplant in the greenhouse or frost-free conservatory. Propagation: Easily propagated from herbaceous stem cuttings or germination of seeds. 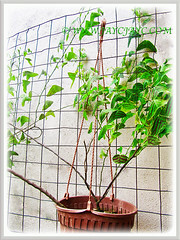 The plant even self-sow easily and numerous seedlings are found sprouting in surrounding pots and on the ground. 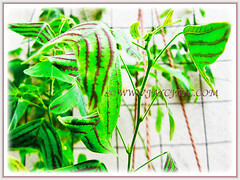 Usage: Christia obcordata or Swallowtail Plant with its captivating variegated foliage will be excellent in hanging baskets or pots. Suitable to be grown in garden beds and borders to add variety, colour and height. Great too for garden landscaping.